Well I am not sure about you, but I don’t think I can ever get bored about finding out another set of measurement that makes me say wow! Yes with the leftovers of ingredients from the various desserts that I did over last week, plus a pack of cream that I got thinking I would need that to make the chocolate kulfi, I simply added few other things and it turned out this deliciously creamy ice cream, that I had to record this. 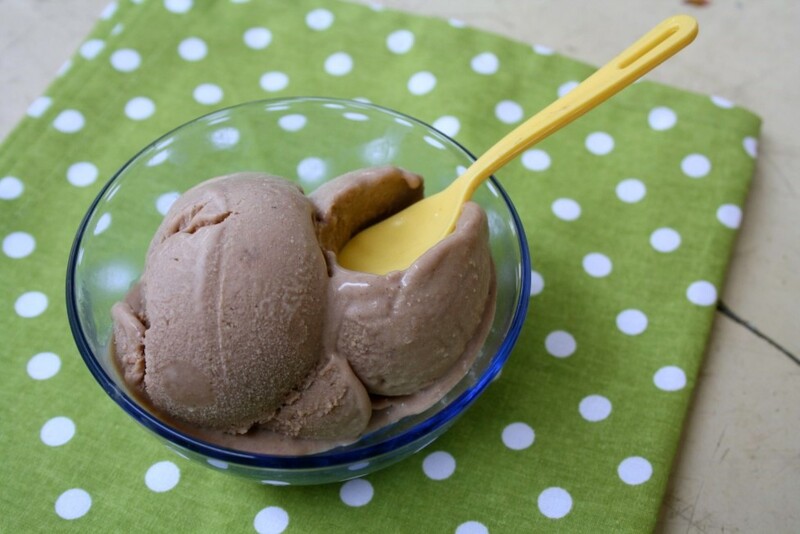 After all chocolate ice cream in any form is simply addictive. The cream that I got was on the verge of getting beyond it’s date and then of course there was that khova that was excess. So imagine how inviting the aroma was wafting out when the entire concoction was in the process of getting cooked. Have you ever been intoxicated just by the aroma, that you might feel you are about to pass out? Well this will surely do that to your senses if you are as attached to that wonderful aroma that comes, when cocoa gets cooked in milk and butter and of course sugar! 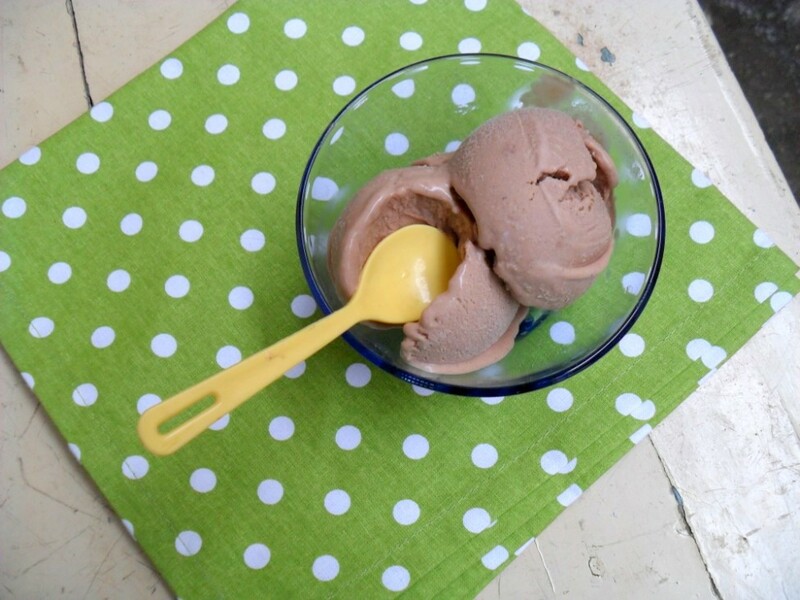 I am calling this as Chocolate Kulfi Ice cream as I kind of combine both my ice cream and kulfi recipe. 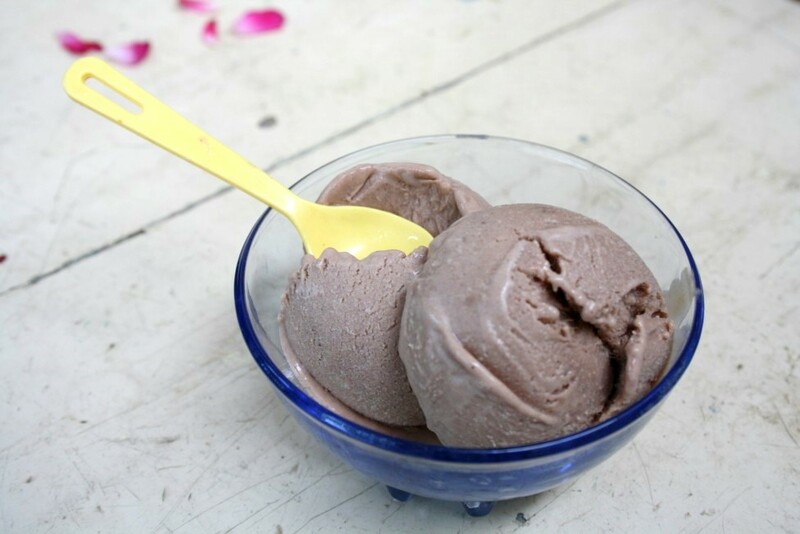 It has that thickness you associate with kulfi and that creamy after taste of an ice cream. Plus the fact that chocolate will simply blow you off, my gosh it’s a treat not to be missed. The best part of the entire exercise was the simple discovery that I used an old ice cream box and it froze so well. I was not in a mood to bring out my usual freezing box and thought would just experiment with that plastic box that used to store regular ice cream and that worked so well. Since I had a half tin of condensed milk open, and half of the khova, I decided to halve the measurement. So used only 2 cups of milk. Take a thick bottom pan and add 1 cup of milk along with half tin of condensed milk. Bring to boil while the flame is still low. Meanwhile in another bowl of 1 cup of milk, add 1/2 tsp of flour and 1 or 2 tsp of cocoa powder. I remembered that increasing the cocoa might also be an excellent idea. Strain it couple of times to make sure it is lump free. By this time the milk and condensed milk mix will start to boil over. This time add this cocoa mix to the boiling pan. Mix everything well. Since I used only about 1/2 tin of condensed milk, I thought I had to add little bit of sugar. It can be added at this stage. Stir well to mix the sugar, when you stir with a ladle, just check if the back of the ladle gets a good coating of the mix. That means it’s done. The cream that I was using a couple of days old, so I was still not sure if it will hold itself. So what I did was to whip it couple of times and then froze it till the boiling part was done. Once the kulfi mix was done, allow it to cool completely. Stir it couple of times to make sure skin is not formed on top. Please remember to whip it well and add the cream to the kulfi only after it is cold and not when it is even warm. Mix well in one direction and then transfer to box, freeze overnight. By morning it was perfectly done and was so creamy. The bowl of ice cream you see in the picture was completely enjoyed by yours truly, dieting can wait for couple of days! Once the kulfi is cooked completely, do strain it couple of times to make sure the whey is completely removed. Be very cautious about mixing in the cream to the cooked mix. Freeze in a plastic container for a quick turn around time. U r still on a roll! Yummy kulfi! My kids will have a blast! wat is Khova? how is i dnt get it here in M'sia?